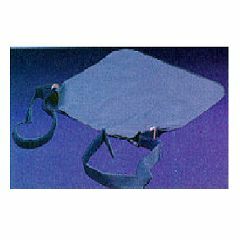 The Mckesson Urinary Drainage Bag Holder is lightweight and constructed of water-proof material. Designed with patients comfort in mind. This item is easy to handle and can be used around the house, at work or even for traveling. Concept of bag good, price reasonable, execution poor. In use proved too small and too weak to hold heavy, full drainage bag. Ordered two bags. Both failed after only a few uses. Charge a little more, use heavier material and add a gusset to make bag easier to use.